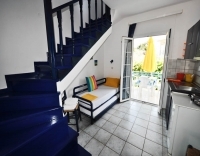 In the beautiful village of Skala Potamia and just a short distance from Golden Beach, surrounded by a lovely landscape that combines green mountains and blue sea, we welcome you to stay in our lovely 2-floor apartments where you can enjoy a wonderful holiday with your family and friends. 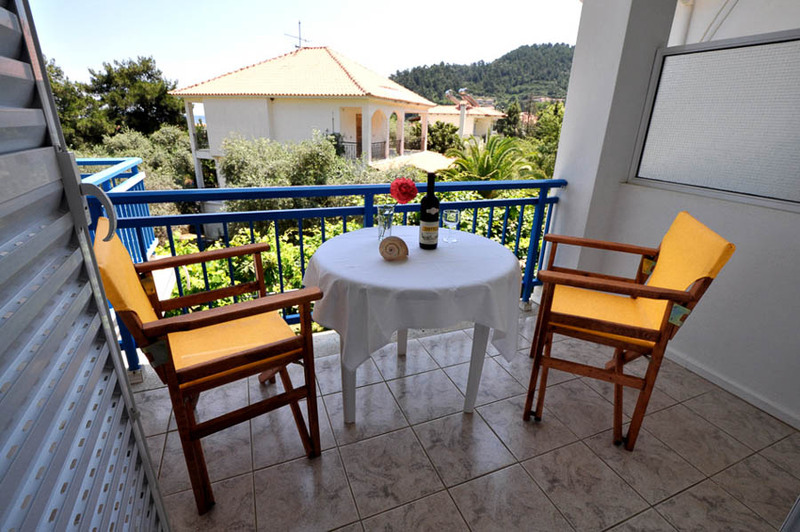 We offer 6 furnished apartments that are equipped for a comfortable self-catering stay, conveniently located next to the island's ring road which provides access to countless beaches and attractions around Thassos. Next to the apartments we offer a delightful garden where you can relax outdoors, have a cold drink and enjoy a tasty barbecue. There is also a playground where the little ones can play. Just a short walk away you will find one of the most popular beaches on the island, along with watersports, beach bars, restaurants, supermarkets, shops, and a whole lot more. A warm Thassos welcome awaits you at Studios Harris! 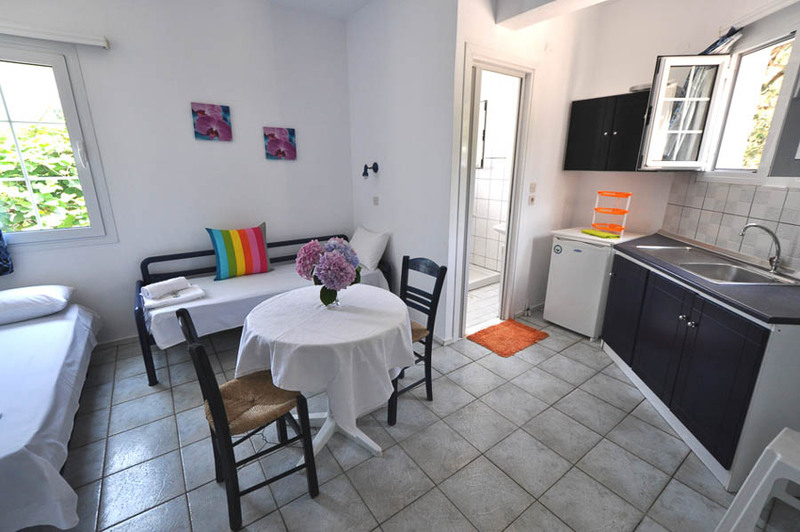 All of the apartments are air-conditioned and have fully equipped kitchenettes, flatscreen TV's, modern bathrooms and furnished balconies or patios. In each of the apartments you will find a spacious first floor which a sofa bed that becomes 2 twin beds, standard sized fully equipped kitchen, dining table and chairs and a large, comfortably furnished balcony with views to our garden. 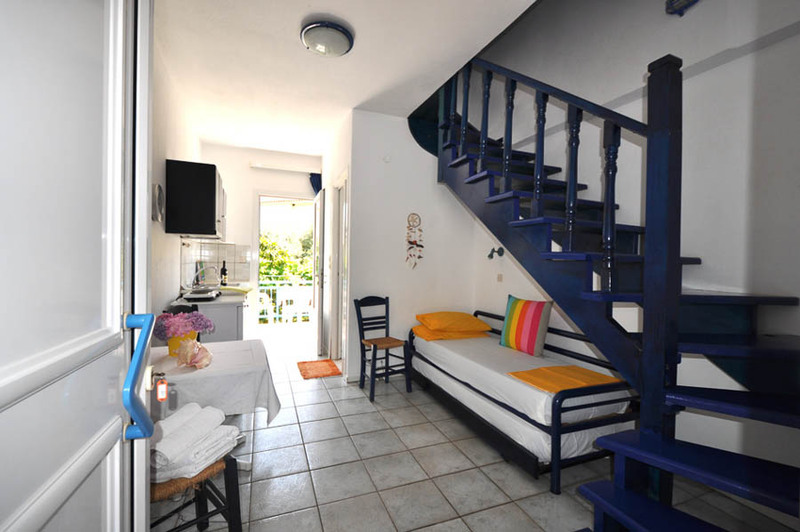 In the upper floor there are 2 twin beds a a spacious baclcony. Wi-Fi is free and available in the apartmetns and outside areas. There is also a communal barbeque in the garden.